Ladies and gentlemen, I hope you will forgive me not being with you in person as you gather together for the release of this most comprehensive report on religious freedom, compiled by the international charity Aid to the Church in Need. The horrendous and heartbreaking events in Iraq and Syria have brought the subject of religious freedom and persecution to the forefront of the world’s news. We have learned with mounting despair of the expulsion of Christians, Muslims and Yazidis from towns and cities that their ancestors have occupied for centuries. Sadly, incidents of violence in Iraq and Syria are not isolated. They are found throughout some, though not all, of the Middle East; in some African nations; and in many countries across Asia. Thankfully, despite this bleak picture, there are inspirational people of different faiths joining together to overcome division and hatred. And, if I might say so, it is a well established principle of interfaith dialogue that we judge each other by the best expression of our faith rather than the worst. Over several decades, I have been working to encourage dialogue and greater understanding between different faith traditions. Indeed, last December, I hosted a reception at Clarence House in response to the growing plight of Christians threatened by persecution in the Middle East. Having listened to their concerns, I did my best to highlight the gravity of the crisis. In February, during a visit to the Middle East, I attended an inter-faith dialogue in Qatar which included key Christian and Muslim scholars and clergy during which we discussed the subject of the Christian-Muslim relationship. It is an indescribable tragedy that Christianity is now under such threat in the Middle East – an area where Christians have lived for 2,000 years and across which Islam spread in 700AD with people of different faiths living together peaceably for centuries. It seems to me that our future as a free society – both here in Britain and throughout the world – depends on recognising the crucial role played by people of faith. And, of course, religious faith is all the more convincing to those outside the faith when it is expressed with humility and compassion, giving space to others whatever their beliefs. With this in mind I would like to suggest several tangible courses of action that I believe might be helpful. First and foremost, rather than remaining silent, faith leaders have it seems to me a responsibility it seems to me to ensure people within their own tradition respect people from other faith traditions. We have yet to see the full potential of faith communities working together. However, to do this effectively, with a truly fraternal approach, requires not only maturity in one’s own faith but also an essential humility. I believe that to speak to another faith tradition and to defend those who follow it, it is profoundly helpful to speak from the core of one’s own spiritual experience. My own Christian faith has enabled me to speak to and to listen to people from other traditions including Islam and, as Pope Francis has recently said, such interfaith dialogue is a necessary condition for peace in the world and should be seen as a duty for all Christians, as well as for believers from other religious communities. Such efforts aimed at peace and mediation are possible. The report from Aid to the Church in Need highlights the example of a Muslim Imam, a Catholic Archbishop and a Protestant Minister coming together to form an inter-religious peace group in the Central African Republic. These seeds of hope can germinate even in nations and regions torn apart by war and violence. Secondly, it is essential that governments honour their duty to uphold the right of people to practise their faith. Article 18 of the Universal Declaration of Human Rights is clear in stating that this right includes the freedom to change one’s religion or belief. Yet even in the West this right is often challenged. Sadly, in many other countries, an absence of freedom to determine one’s own faith is woven into the laws and customs of the nation. However, in seeking to persuade others of our point of view, it is essential that we all take steps to understand the values and beliefs of others. It is for this reason that I can only commend a recent initiative by the Foreign and Commonwealth Office to establish an in-house training programme aimed at British diplomats on the subject of religion and foreign policy. Finally, ladies and gentlemen, we are living in a world in which we are frequently presented with so many profoundly disheartening news stories, yet it is important that, on a personal level, we do not lose hope. And this is why I was encouraged to see the story of Meriam Ibrahim feature in this report. Imprisoned in Sudan, pregnant, and facing a death sentence for reportedly converting to Christianity, Meriam remained true to her beliefs. So, my heart goes out to all those around the world, but especially at this time in the East – whether Christian, Muslim, Jewish, Buddhist or Hindu – who are so brutally persecuted solely for the faith they profess. I pray, too, that all people in communities will engage in building respect and tolerance, for without these, the very freedom on which society is built is threatened with destruction. It reads like a pastoral letter – a New Testament exhortation for believers to endure their present sufferings because the Day of Salvation is near. Building bridges across the faiths is a laudable objective: Blessed are the peacemakers, for they shall be called the children of God. 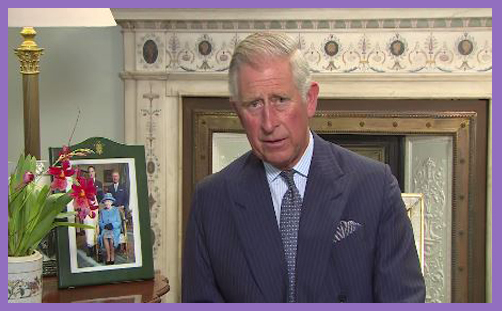 It is good and right to acknowledge all those who work tirelessly for peace, reconciliation and mutual understanding, of which the Prince of Wales is rapidly becoming a leading and increasingly influential figure. Some will dismiss this message as being of little political consequence: mere words from a plaintive prince in search of a role. But words are not inadequate when they come from the lips of the future Defender of the Faith: if Prince Charles were to become as active in the pursuit of religious liberty as he has been tireless and tenacious in the defence of architectural aesthetics, the natural environmental and alternative medicine, he will rise to be leader of the religiously free world – because no one else seems to want the job. So don’t mock or scorn: please pray for him. He may have no armed divisions at his literal command, but he considers theology and wrestles with philosophy, and grasps the spiritual reality that we battle not against flesh and blood but jihadi principalities and powers. And they will never be defeated by bombs and bullets, but by the words that proceed out of the mouth of God.